Appeared in Vol 2. No 3. 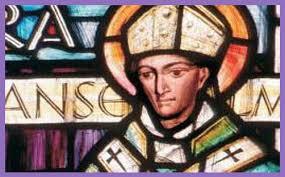 St. Anselm of Canterbury (1033-1109), a Benedictine abbot and archbishop, was one of the foremost philosophers of the middle ages. One of his most intriguing contributions was his so-called ‘ontological argument’ for the existence of God. Basically, Anselm argued that even the fool must admit that God is “that than which nothing greater can be conceived”. But this concept implies the existence of the thing conceived for God would not be “that than which nothing greater can be conceived” if He lacked existence. Put in a rudimentary and non-technical form, the argument is as follows: a) I can think of God as “that than which nothing greater can be conceived”; b) but any conception or thought is a form of “being” or existence; c) therefore, God exists. As Josef Pieper pointed out, the argument hinges on the notion of God as pure being, and pure being includes within itself both existence in reality and existence in the mind. Indeed, as existence is the essence of God, the non-existence of God cannot be conceived. The interesting thing about this argument is that, while it is taken to be self-evident, it immediately boggles the mind especially the modern Western mind. Indeed, Anselm’s proslogion, in which the argument was advanced, was immediately attacked by Gaunilo of Marmoutier, whom Anselm later answered in a Responsio. Robert A. Herrera takes up the Proslogion argument again in the article that follows, but he suggests that commentators have missed much by considering the argument only as dialectical syllogism. Rather, Herrera contends, Ansedm meant the argument to be a starting point in an understanding of God which would generate love, and which, nally, would result in that very joy of the experience of God which is a foretaste of eternal life.